Armenia is a country laying in the region of the southern Caucasus, country borders with Georgia and Azerbaijan on the north and east, and with Iran and Turkey on the south and west. 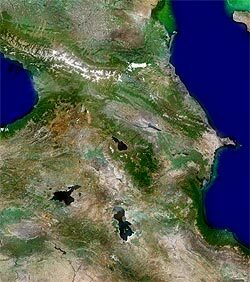 Azerbaijan is a country in the southern Caucasus. It borders the Caspian Sea in the east, Georgia and Russia in the north, Iran in the south, and Armenia in the southwest and west as well as has a short border with Turkey in the northwest. Georgia is a country in the Caucasus at the east coast of the Black Sea. It is bordered on the north by Russia, on the south by Turkey and Armenia, and on the east by Azerbaijan.